When we think about food waste, our minds usually turn to the people those discarded meals could feed. But that’s not the only consequence. Researchers at the University of Texas uncovered another problem with excessive food waste: wasted energy. The energy it takes to get food from farms, production plants, and the wild to our plates is huge: It makes up an entire 10 percent of the nation’s energy use. And a good chunk of that energy—enough to power the state of Washington for almost an entire year—goes to producing the food that ends up in the garbage. A. Why do we waste food? For industrialized countries, more food is wasted as compared to the developing countries. 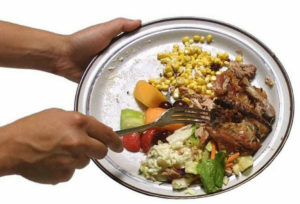 In addition, less food is wasted at the consumer level for developing countries. B. Food that is wasted has several environmental, financial and social impacts. What are these impacts and what can we and the government do?